"One of the key element of the Chinese New Year is the Monster Nian, a mix of a dog and a lion. The tale says that the Nian would come out of its hiding every winter and kill the children in the village. The villagers were very afraid every year and hid in their houses until one day an old man appeared and revenged the Nian. He set up red papers and used firecrackers to get rid of the beast, which was scared by loud noises and the colour red. Today the Lunar New Year still gets celebrated with firework and dressed in red clothes, resulted by the tale of the Nian." 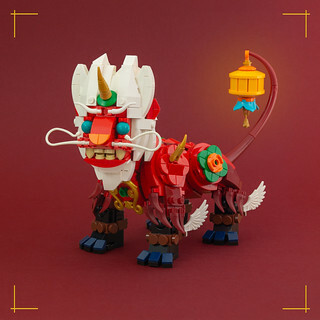 Inspired by the two lovely sets LEGO designed for this year Lunar New Year I read a bit about this Chinese festive days and stumbled across the Monster Nian. I thought if would make a great inspiration for a brick-built model and a perfect fit for this years Brickstory contest as it is a symbol of the wealthy Chinese culture and their many tales and stories. While I wanted to build my own Nian, the design was particular inspired by this artwork. I would have loved to upload this on the 5th of February, which is the date of the Chinese New Year 2019, but the deadline of the contest is in a few days. So happy CNY in advance.